Tory Kingdon picks out highlights from the world’s largest furniture fair, Salone del Mobile, which takes place this week... Jumbo The Jumbo Group will present a number of new collections from its range of brands at the Milan event. Key items include the Turkana coffee table, an asymmetric formation of marble and onyx slabs, and the glamorous Malawi sofa, with a pale pink leather nubuck upholstery, fringing and studs, from Roberto Cavalli Home Interiors. 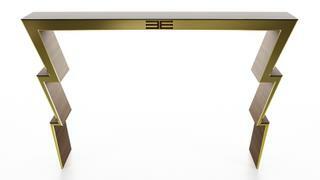 Similarly striking pieces from Etro Home Interiors include the David Bowie-inspired Ziggy console (pictured), crafted from frisé eucalyptus wood and polished brass, and the Mythos dining table, with a base in matt dark wenge wood, a glass and brass top, supported by two Pegasus models in red lacquered resin. For something a little less avant garde, look to Gianfranco Ferrè Home’s presentation of a four-seat sofa, bed and armchair under the Highlander collection – a contemporary style with a nod to traditional upholstery methods, from capitonné to light quilting and pleating. 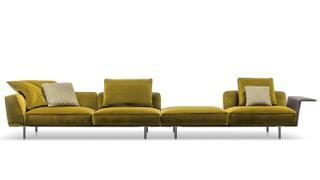 The Jumbo Group will present a number of new collections from its range of brands at the Milan event. Key items include the Turkana coffee table, an asymmetric formation of marble and onyx slabs, and the glamorous Malawi sofa, with a pale pink leather nubuck upholstery, fringing and studs, from Roberto Cavalli Home Interiors. Similarly striking pieces from Etro Home Interiors include the David Bowie-inspired Ziggy console (pictured), crafted from frisé eucalyptus wood and polished brass, and the Mythos dining table, with a base in matt dark wenge wood, a glass and brass top, supported by two Pegasus models in red lacquered resin. For something a little less avant garde, look to Gianfranco Ferrè Home’s presentation of a four-seat sofa, bed and armchair under the Highlander collection – a contemporary style with a nod to traditional upholstery methods, from capitonné to light quilting and pleating. 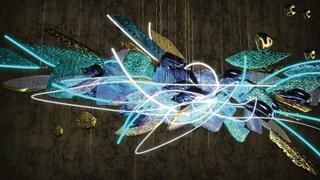 Lasvit’s creations never fail to dazzle, and this year the Czech lighting and glass specialist will be presenting four impressive installations at Euroluce, guaranteed to capture the imagination. Mária Čulenová-Hostinová, Wanda Valihrachová, Maxim Velčovský, Kateřina Handlová and Katarína Kudějová Fulínová have designed pieces and each installation is inspired by one of the elements of Lasvit’s “Theory of Light”, which states that the beauty of light consists of four key elements: reflection, spectrum, nature and perception, while also intending to demonstrate “the beauty and power of light” hidden within the glass itself. 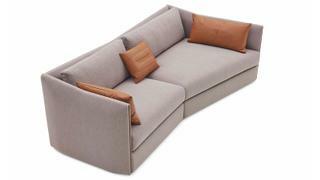 Armani/Casa will be presenting a new piece from its collections exclusively at Salone del Mobile. 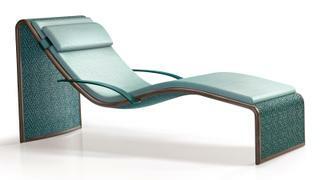 The Onda chaise longue is a chic, unique design featuring a curved frame covered in woven leather with a solid wood edge, leather upholstered armrests and a padded mattress and headrest. Its curvature and pale blue hues are inspired by waves, making it a fitting contemporary choice for a superyacht’s master cabin. Inspired by the “metropolitan dynamism of Milan”, Trussardi Casa’s Salone collection, designed by Carlo Colombo, represents pure Italian style. Soft leathers are combined with gunmetal, brushed bronze and polished brass, as well as woods in wenge-stained oak; surfaces feature Carrara, Emperador Dark, Marquina and Breccia Sarda marble. 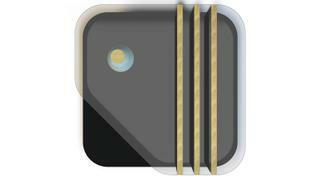 It is a modern collection that references the traditional materials of the past. On the Trussardi Casa stand, expect a soft, relaxing scheme where leather panelling and mirrored surfaces are combined and natural colours mix with more intense hues. Mascheroni is known for creating innovative, customised home-cinema products for private clients, high-end clubs and luxury hotels. This year at Salone it will be presenting a new item, Hollywood Filmur, intended to solve the problem of having a comfortable cinema chair that needs to be placed flush against a wall. As well as offering total comfort and elegant old-world style, the chair can be reclined and the footrest extended at the touch of a button, while the back structure of the chair remains in place. To mark 15 years since its launch, Visionnaire will present an 80-piece Anniversary collection, with items designed by such respected Italian names as Alessandro La Spada, Roberto Lazzeroni and Marco Piva, as well as international figures Steve Leung and Maria Serebryanaya. 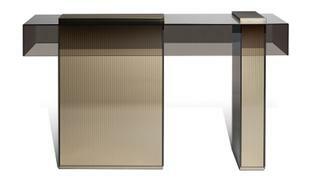 There are novel combinations of materials and architecturally inspired shapes, such as Piva’s Marty console table (pictured) comprised of a glass cuboid that floats on two angular stone and metal prisms, or La Spada’s Kerwan dining table, where a slab of “invisible grey” marble sits on curved steel legs with a mirror- finish reflecting the surrounding space. Marioni’s Salone presentation features something a little quirkier with the Palm collection, a series of pieces of furniture inspired by the seaside architecture of the 1930s and 40s. Tables, consoles and bookcases feature modular ceramic elements, brass frames and lacquered wood tops. Each piece is customisable in finish and colour. The Palm forms part of the 2019 collection, designed with Notorious, which draws on the golden age of Hollywood and the silver screen as a theme. 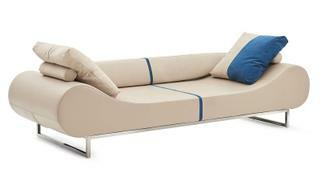 Vincent Van Duysen has designed the Gregor modular seating system for Molteni&C. The range includes various straight, corner and peninsular units that can be mixed and matched to create the seating layout of your choice. Each unit comprises a steel base in a new zinc finish, and its seat and backrest are covered in leather, with the backrest displaying a large stitching detail. 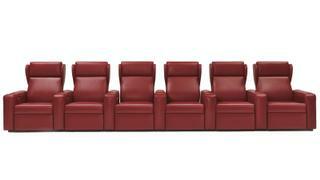 There is an option for leather-covered wing-shaped armrests, or an alternative trapezoidal, padded, slightly flared version. Formitalia will present the new Glamour collection at Salone: a range of seating, a bed and small tables that epitomise pared back luxury. The Giulia sofa and co-ordinating seating are characterised by an elegant tubular metal structure with a satin champagne gold finish, with upholstery available in fabric or nappa leather with a choice of more than 50 colours. 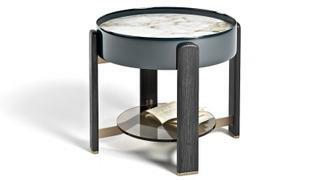 The Kean small tables have a similar champagne gold finish on their frames, while black open-pore ash wood legs and marble tops with leather-covered edges. If you’re in need of new crockery, look to the charming Coralloset of fine china, which features coral motifs and coral and gold decorative finishes. to the charming Coralloset of fine china, which features coral motifs and coral and gold decorative finishes. To celebrate its 30th anniversary this year, Fendi Casa has reinterpreted three iconic pieces, to be presented at the Luxury Living store in Via Durini 25, Milan, during Salone. The Cosima dormouse from 1994 has been reproduced with a seat in blue nubuck leather and combined with the Claudio armchair and Ripetta pouf. There is also the 2004 Eros sofa (above), popular for its elegant, balanced design and versatility, as well as a reproduction of the 2018 One sofa intended to represent Fendi Casa’s style today. Borzalino’s Ayton sofa, designed by De Bona De Meo, features a cushioned seat on a solid structural base and was inspired by the “Nordic geometry of the 1950s”. The Ayton range’s seats and shelving allow you to create a cool modern-retro scheme, while the Diva chair (pictured) is pure art deco. 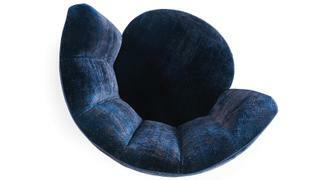 Designed by Carlo Bimbi, the small armchair has a shell-shaped backrest and is available with a swivel base. You can find Preciosa Lighting at Euroluce 2019, where it will present a curation of its contemporary Collections line. 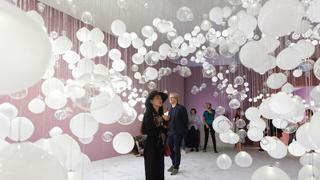 It will also be showcasing interactive designs Breath of Light and Pearl Wave, an adaption of its Signature Design Pearl Drop and Carousel of Light, an interactive installation.